Promo Checker is a bespoke service offered by Cash & Carry Management, designed to give suppliers a helping hand. With sales forces getting smaller and depot visits more infrequent, Promo Checker will aid your knowledge of your brands and competitors’ brands in depot. We offer a website reporting national promotional activity from suppliers in key wholesale outlets. We have been aware for some time that suppliers collate promotional activity on an ad hoc basis and we saw an opportunity to save you time and money and create a more structured solution. Over the past four years, we have been collecting data and this is now ongoing. We have promotional data covering the major cash & carries. You can view promotions by category, product description, manufacturer’s name, wholesaler, or promotional date. Information that you will find on this site includes WSP, RSP, POR and any deal mechanic. We have created a platform to view all suppliers’ activity across different operators via one website. With Promo Checker you can check previous or current activity, as well as competitors’ promotions, and download into Excel or store offline. All data is updated monthly. Additional management reports and sector promotional overviews are also available on request. This service should save time and money and your sales team can be updated instantly. This is a simple subscription service with quick access via our website. Additional services such as depot checks are available on request. 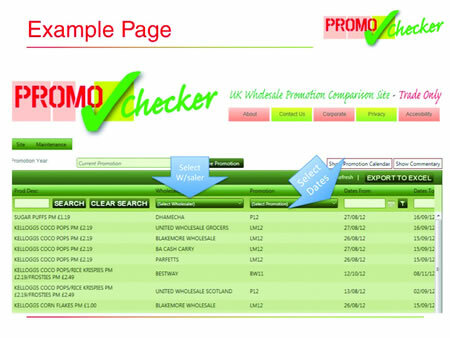 Promo Checker is obtainable at the cost of £599.00 for three users per single category annually. If you operate in multiple categories you will receive a discount on the normal charge. For further information, please contact Martin Lovell on (01342) 712100.